This is a short interview with David Bowen, who won the third prize in the VIDA 12.0 Fundación Telefónica Art and Artificial Life competition. VIDA rewards electronic works of art produced with artificial life technologies. The other laureates of the 12th edition of the award are Guy Ben-Ary, Philip Gamblen, Peter Gee, Nathan Scott, Brett Murry, and Dr. Steve Potter and his team (first prize with Silent Barrage), and Andreas Muxel (second prize with Connect). Growth Modeling Device is a kinetic installation based on the rate of growth and structure of a onion plant. In this video, David Bowen explains how his Growth Modeling Device works. David Bowen’s Growth Modeling Device has also won grand prize in the art division at the 13th Japan Media Arts Festival. His Wind Drawing Device is currently featured in Data + Art at the NASA Jet Propulsion Laboratory in Pasadena. 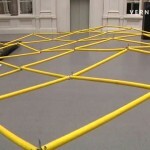 David Bowen: Growth Modeling Device / VIDA 12.0 International Awards / ARCO 2010. February 18, 2010. This segment has been realized with the kind support of Turespana.